In these troubled economic times, a great way to save some money is to make your own dough. No, no, no, we don’t mean that you should start printing your own money! We mean it literally; make your own pizza dough. It’s fun, delicious, lets you control your ingredients and is easier to make than you think. Our philosophy: if you have the equipment, there really is no need to knead. Make the dough hook or dough blade on your stand mixer or food processor do the kneading for you! Don’t have one of these handy contraptions in your kitchen? 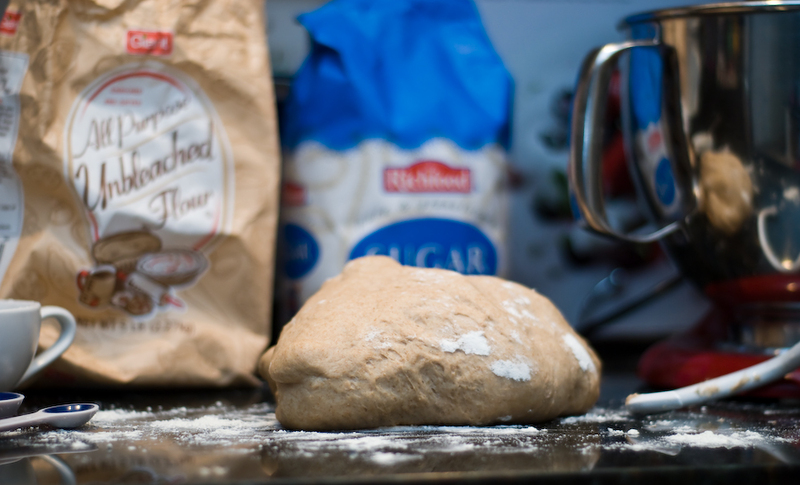 Just think of kneading dough as a great upper body workout! – Measure 1½ cups of warm water in a measuring cup. Add into that about 1½ teaspoons sugar and one packet (2¼ teaspoons) dry yeast. Let that stand for about 10 minutes until it’s foamy. – In a big bowl – preferably one that attaches to your stand mixer or food processor – mix 1½ teaspoons salt with 2 cups whole wheat flour and about 2 cups all purpose white flour (unbleached, unbromated usually works best). Once the yeast mix is foamy, dump it into the bowl. – If you’re kneading by hand: use a plastic or wooden spoon to mix ingredients into a sticky ball, transfer to a floured surface and, as you knead, add small handfuls of white flour to the dough until the it is smooth and elastic. – If you’re using the dough hook: attach the hook to the machine, and turn it on to the lowest “stir” setting once it’s in the locked position. After the flour and liquids are combined into a sticky mess, start adding small handfuls of white flour to the dough until the dough is smooth and not sticking to the bowl. After a few minutes of letting the machine run on the two lowest settings, as needed, the ball of dough should be clinging to the hook, NOT the bowl. – If you’re using the dough blade in the food processor: measure all dry ingredients into food processor bowl, make sure the “dough” button is on and start machine. Pour in wet yeast mix and add small spoonfuls of flour until dough forms a cohesive ball that isn’t sticking to the sides of the bowl. This process takes about a minute or two. – Place the dough in a bowl very lightly coated with oil or cooking spray, cover tightly with plastic wrap and place a kitchen towel on top of the bowl. Let it rise for about an hour and a half, after which time it should have doubled. – After the dough has doubled, put it onto a lightly floured surface, punch it down a bit, and cut into two or three pieces, depending on the size crust you desire. – If you intend to store the dough, wrap each piece tightly in plastic wrap and then place it in a freezer bag. Dough freezes well and placing it in the freezer immediately helps stop the rising process. You’ll find that if you keep your wrapped dough in the refrigerator right after making it, it tends to keep rising and can burst through the plastic wrap. OK, we get it. Not everyone is as excited about making their own dough at home. So what healthy options are there for pre-made crusts or dough alternatives? One shortcut, yet still homemade method, is to let the bread machine do the work to make the dough. If you’re still not convinced into making homemade dough, most grocery stores carry pre-made, uncooked dough in the refrigerated section. While you’re there, check for refrigerated dough such as Pillsbury, which is versatile for more than just traditional pizza. And for the super shortcut method, there are a number of pre-packaged crusts available – in thin and regular – such as Boboli and Mama Mary’s. Let’s not forget about some great crust substitutes such as English muffins, bagels, pita, tortilla, and various types of crackers. Be creative with your base layer, and use what’s on hand. Smaller “crusts” make for great individual servings, and usually hold up well for short cooking periods in the microwave. Two weeks ago we promised in our post about making a healthier pizza pie that we’d talk about dough. Now we’d love to hear your creative ideas about creating a healthier pizza. Comment right here on the blog or send us e-mails about your successes in the kitchen with homemade pizza and crust at [email protected] Happy Eating! How Stacey got the shot: on the kitchen counter, 50mm fixed focal length lens at f/1.8. Flash bounced off the ceiling, captured in 1/200th of a second. Measure 1½ cups of warm water in a measuring cup. Add into that about 1½ teaspoons sugar and one packet (2¼ teaspoons) dry yeast. Let that stand for about 10 minutes until it’s foamy. In a big bowl – preferably one that attaches to your stand mixer or food processor – mix 1½ teaspoons salt with 2 cups whole wheat flour and about 2 cups all purpose white flour (unbleached, unbromated usually works best). Once the yeast mix is foamy, dump it into the bowl. If you’re kneading by hand: use a plastic or wooden spoon to mix ingredients into a sticky ball, transfer to a floured surface and, as you knead, add small handfuls of white flour to the dough until the it is smooth and elastic. If you’re using the dough hook: attach the hook to the machine, and turn it on to the lowest “stir” setting once it’s in the locked position. After the flour and liquids are combined into a sticky mess, start adding small handfuls of white flour to the dough until the dough is smooth and not sticking to the bowl. After a few minutes of letting the machine run on the two lowest settings, as needed, the ball of dough should be clinging to the hook, NOT the bowl. If you’re using the dough blade in the food processor: measure all dry ingredients into food processor bowl, make sure the “dough” button is on and start machine. Pour in wet yeast mix and add small spoonfuls of flour until dough forms a cohesive ball that isn’t sticking to the sides of the bowl. This process takes about a minute or two. Place the dough in a bowl very lightly coated with oil or cooking spray, cover tightly with plastic wrap and place a kitchen towel on top of the bowl. Let it rise for about an hour and a half, after which time it should have doubled. After the dough has doubled, put it onto a lightly floured surface, punch it down a bit, and cut into two or three pieces, depending on the size crust you desire. If you intend to store the dough, wrap each piece tightly in plastic wrap and then place it in a freezer bag. Dough freezes well and placing it in the freezer immediately helps stop the rising process. You’ll find that if you keep your wrapped dough in the refrigerator right after making it, it tends to keep rising and can burst through the plastic wrap. Pizza was great, as usual. Love the shot, you really captured the dough’s texture really well. Genuine!